Posted November 30th, 2017 by magnifycreativeadmin & filed under . 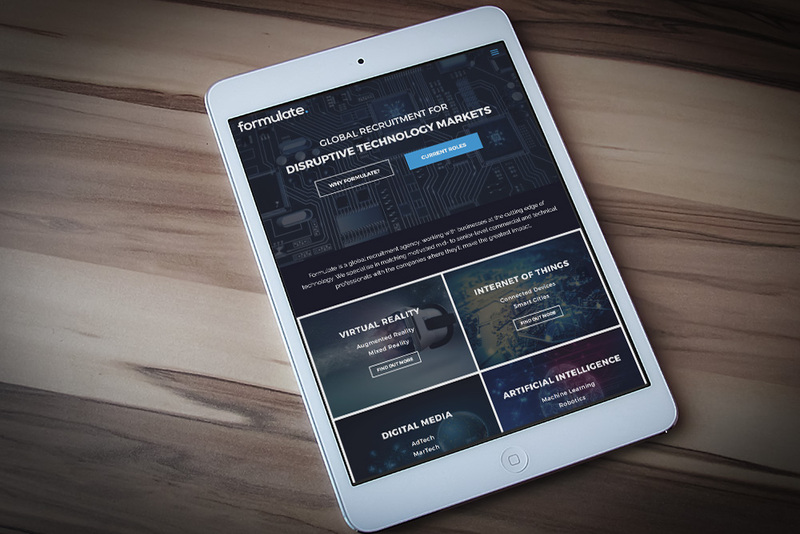 Formulate are a global recruitment agency who work with businesses in the “disruptive” and “emerging” technology markets. The brief for the new website was to help them stand out from the crowd of old fashioned, generalist recruitment agencies. They wanted to appeal to their technology savvy target audience and realised that a run of the mill approach wasn’t going to suit. We started by refreshing their branding identity and helped them to craft their unique selling point. The next challenge was to simplify the categorisation of the ever changing industry sectors in which they operate. Website users are greeted with a fullscreen video background which draws attention to the main calls to action on the homepage. The site has a modern “mobile first” style and the information is presented in blocks of content which are easily differentiated from each other with the use of strong, on-brand imagery. The homepage showcases all inner aspects of the website and is easily navigated. This helps to reduce the bounce rate of visitors leaving the site without clicking into the inner pages. The current roles can be searched and filtered by type/location.